This is part 2 in a two part series on Central Christian Church. The first installment discussed the building and the church itself with some interesting tidbits. An earlier post on this site commented on the prayer garden at the church. 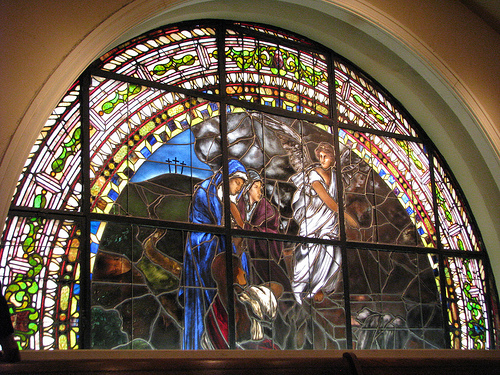 "The Good Shepherd" Stained Glass Window - Central Christian Church - Lexington, Ky.
No longer visible from the sanctuary after a post-fire remodeling of the historic sanctuary of Central Christian Church in downtown Lexington, "The Good Shepherd" stained glass window is alit and visible in the evenings on Martin Luther King Blvd. and from a mechanical room on the church's interior. 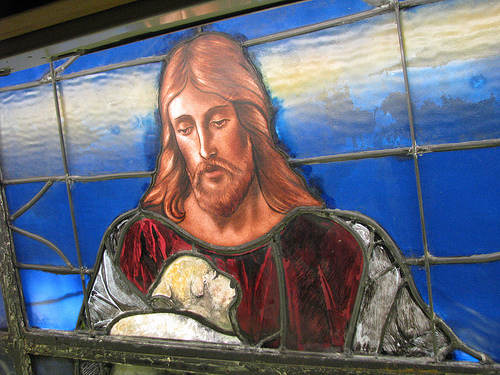 A platform in the mechanical room brings you nearly to the face of Jesus, carrying the lost sheep to safety. The powerful art and imagery at Central Christian Church are reminders of their faith, designed to deepen spiritual understanding. A publication, Symbols in Our Journey of Faith, examines the art in this impressive church, as well as its meaning. After ascending the stairs along Short Street, one encounters the hand carved doors made of American Red Oak. Installed in the spring of 1980, each of the six doors depict a different figure in the Christian (Disciples of Christ) faith: Moses, David, the prophet Micah, Jesus of Nazareth, St. Paul the Apostle, and Barton Stone. 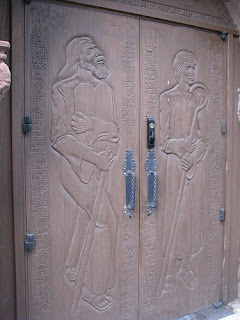 Each pair of the highly symbolic doors close beneath a tympanum complete with more Judeo-Christian symbology. Another entry to the church is through the prayer garden - a common feature found in churches as reminders of the first garden - "Eden, when God and humankind lived together in a relationship of absolute trust and obedience." The prayer garden was added during renovations to the church in the 1950s. Upon entering the sanctuary at Central Christian Church, one is immediately taken by the most impressive collection of stained glass windows. Each is described in Symbols, but I will highlight a few. In the rear of the church balcony is the Empty Tomb depicting the Easter scene of the angel in white advising Mary Magdalene, Mary the mother of James, and Salome of Christ having been raised while the three wooden crosses of Golgotha are depicted in the window's upper left. 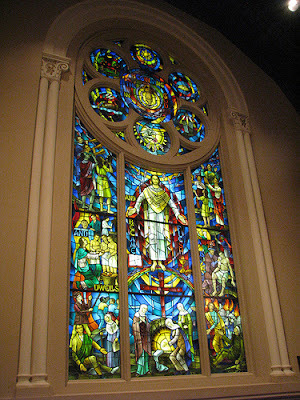 Behind the chancel is the most impressive of the windows: God at Work in the World. The upper portion consists of a rose window with a central depiction of the hand of God under a crown with the words from Genesis, "In the beginning, God." Each petal in the rose window are representative of God's work in the world. 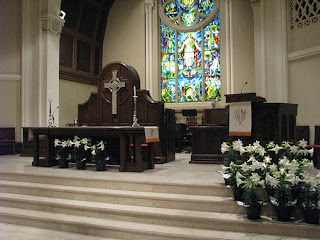 Below the rose window, Christ stands with outstretched hands - "and became flesh." Several Biblical scenes surround the Christ. Many other stained glass windows frame the sanctuary: Gospel windows, The Three Graces (faith, hope, charity) window, and several Maltese crosses included. Centrally located behind the communion table is an ornate Celtic Cross dedicated in 1969. It is a reproduction of the St. John's Cross at the Iona Abbey in Iona, Scotland. Handcrafted in Scotland, the cross itself weighs nearly 100 pounds. Ancient symbolism are engraved into both sides of the cross, though weight and display options limit viewing to only the one side. The Celtic Cross is typically associated with the Scottish Presbyterian Church, of which many early Disciples of Christ leaders were first associated. Regardless of your faith preference, one must stand in awe of the beautiful sanctuary and structure of Central Christian Church. Like an onion, each layer of meaning and symbolism can be peeled away to reveal more meaning and symbolism in the church's journey of faith. Sources: Central Christian Church (DoC), Symbols in Our Journey of Faith.